Walking down the old airport road, one usually tends to observe stores and places to eat in case we’re ever stuck in traffic and there’s no way out. One such day, we passed a structure that screamed ‘artsy home décor’ – and we decided to check it out. Mumbai Bazaar is a huge two-storey structure that’s full of all things wonderful, from handicrafts to paper mache and even antiques. 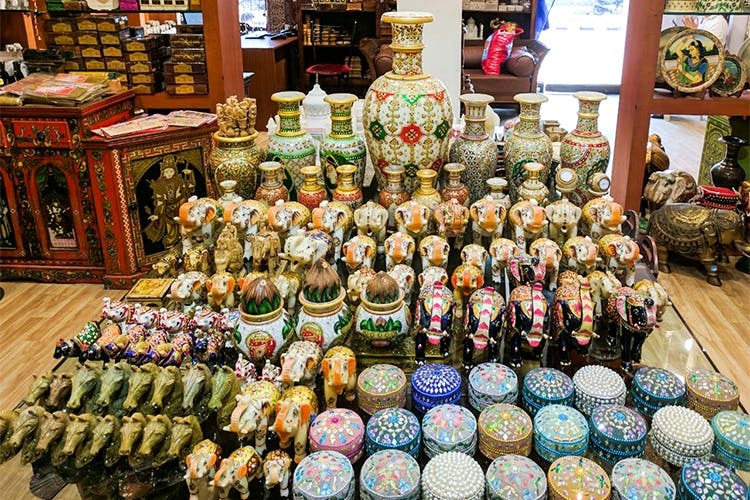 As soon as you enter the store, you’ll see walls dedicated to various sections like stoneware (candle holders, decorative pieces and more), antique pieces made out of camel bone, brassware items (decorative pieces, urns, Warli art), marble decorative plates, urns, decorative pots, furniture and even a section for decorative knives. You can buy home décor for as low as INR 300 for smaller pieces. As you walk in a little further, you’ll see a section that’s dedicated to suit materials, so you can pick your fabric and colour and they will stitch it for you. The upstairs section is dedicated to carpets and shawls. Their carpets are handmade and Kashmiri in design, and start at INR 80,000 for the large pieces. Their shawls and stoles start at INR 1,000. Head out there for your fix of great Kashmiri art, home décor and antiques. We think it’s great that parts of the city still have hidden gems like these tucked away in corners. The store is open all days of the week.